Home Page Can You Help? 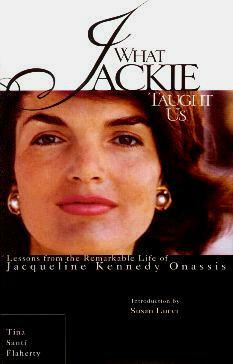 Yet another book on one of the Kennedys, and in particular, Jackie Kennedy. Starting with a brief recapping of Jackie's life, author and New York neighbor Tina Santi Flaherty, gives us her spin on the things Jacqueline Bouvier Kennedy Onassis "taught" us during her lifetime. We all know she had a certain presence, great style and panache, and her legacy continues to fascinate some people. Having had the good fortune to have been born into money, plus her voracious appetite to read and learn as much as she could, afforded the young Jackie opportunities to study and travel. Not an option to most others at that time. Her steely determination (she sounds like she was a bit of a brat demanding her own way) to do things her way, her good manners in thanking hosts with personal notes within 24 hours, her sense of extravagance when decorating homes or dressing herself (thankfully she had good dress sense), and her natural flair all helped to make her the most admired and emulated First Lady. It's been about 50 years since she was in the White House and about 10 years since her death from cancer, yet the idolizing and fascination continues unabated. This isn't a great book - it gives a little history about Jackie's youth, and as First Lady, and points out her good qualities like her courage, focus, image and style, and motherhood, all things we can learn from. Personally, what I learned from Jackie was to never get involved with a womanizer. I wish, however, I had her ability to get excited about learning so much. Conclusion - An okay book. Would appeal to Jackie fans especially. Nothing revelatory or new. Annoyingly repetitive throughout the book.